Pat Tillman Foundation invests over $1.1 million in academic scholarships to empower newest class of service members, veterans and military spouses. To date, the Pat Tillman Foundation has invested over $15 million in academic support, and named over 520 Tillman Scholars at over 100 academic institutions nationwide. From July 20th-23rd in Chicago, the foundation will convene the 2017 Pat Tillman Leadership Summit powered by the NFL, bringing Tillman Scholars from around the country to address some of the toughest challenges impacting the country and their communities. Founded in 2008, the Tillman Scholars program supports our nation’s active-duty service members, veterans and military spouses by investing in their higher education. The scholarship covers direct study-related expenses, including tuition and fees, books and living expenses, for scholars who are pursuing undergraduate, graduate or professional degrees as a full-time student at a public or private, U.S.-based accredited institution. Each year, the foundation is proud to collaborate with 15 University Partners to identify and select qualified candidates on their campuses for the Tillman Scholar screening process. These University Partners offer innovative, veteran-specific services and a strong culture of support for military veterans and spouses while providing rigorous academic experiences. University Partners include Arizona State University; Columbia University; Georgetown University; George Washington University; Indiana University; Texas A&M University; The Ohio State University; Syracuse University; University of Arizona; University of California, Los Angeles; University of Maryland, College Park; University of Minnesota; University of Missouri System; University of Oklahoma; and University of South Florida. If you are a member of the media who wishes to arrange an interview with Pat Tillman Foundation Board Chair and Co-Founder Marie Tillman, Executive Director Killjan Anderson, or a 2017 Tillman Scholar, please contact Jill Walsh at (773) 828-5413, jwalsh(at)pattillmanfoundation(dot)org. In 2002, Pat Tillman proudly put his NFL career with the Arizona Cardinals on hold to serve his country. Family and friends established the Pat Tillman Foundation following Pat’s death in April 2004 while serving with the 75th Ranger Regiment in Afghanistan. 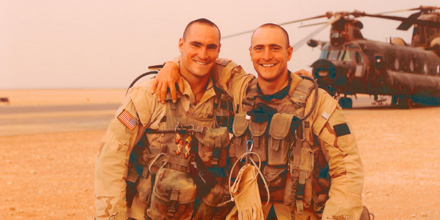 Created to honor Pat’s legacy of leadership and service, the Pat Tillman Foundation invests in military veterans and their spouses through academic scholarships–building a diverse community of leaders committed to service to others. For more information on the Pat Tillman Foundation and the impact of the Tillman Scholars, visit http://www.PatTillmanFoundation.org.